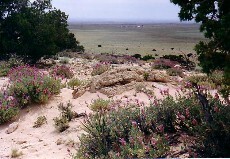 Panoramic view of meteor crater west rim to northwest rim from the east side. 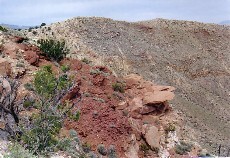 This set of photographs shows views of the crater from the hiking trail around the rim. 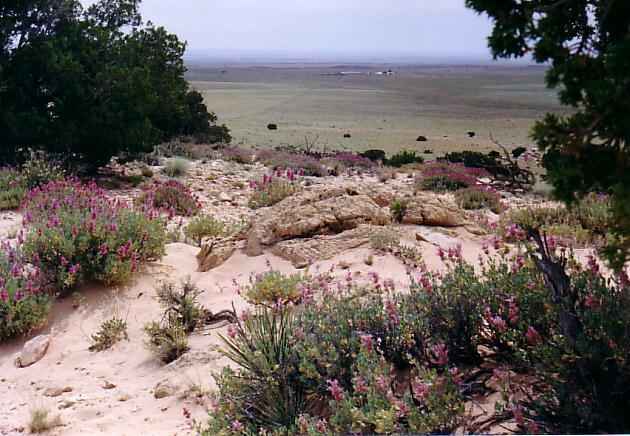 There are photos of the surrounding desert and the park headquarters as well. 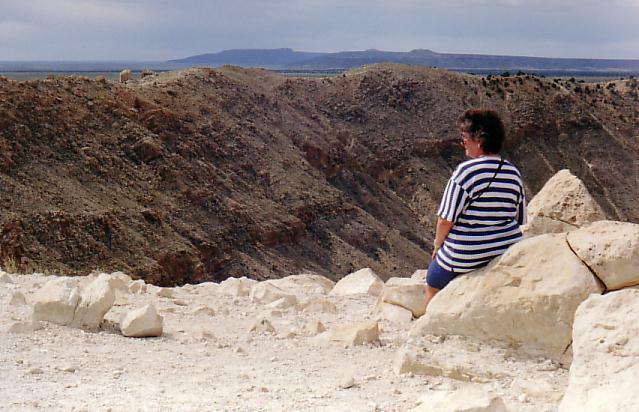 I have read that visitors are no longer allowed to hike the rim trail and, when we were there in 1992, visitors weren't allowed to hike to the bottom of the crater. I hope that this 'virtual tour' around the rim will provide some indication of the magnificence of this unique astronomical/geological feature and that you don't get as tired of looking at the pictures as my wife did of walking around the rim! 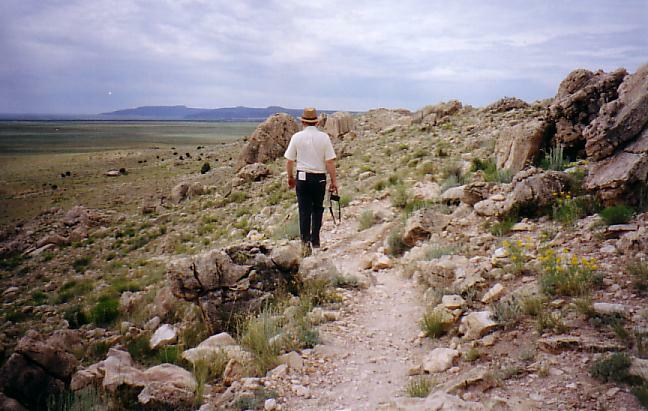 The trail is about three miles long (based on a crater diameter of about a mile) and has many changes in elevation. 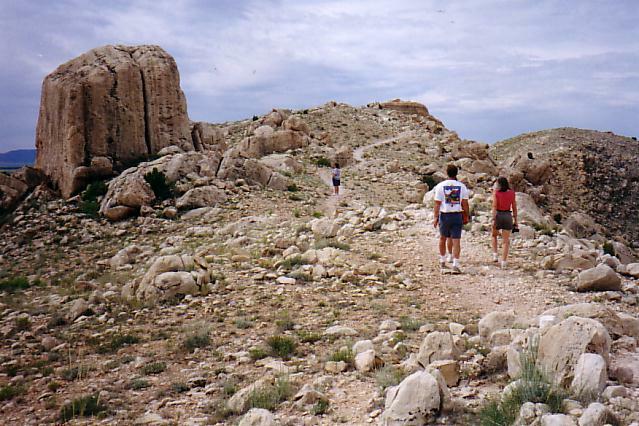 It was a pretty good hike for 50-year-old people who aren't very physically active. Click photos for 400 x 600 pixel versions. View of the north rim looking west past headquarters from the high point east of the building. A group of people is visible on the outlook deck at lower left. 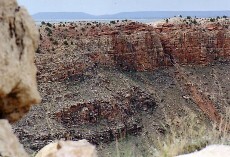 This part of the rim is visible in the panoramic view from left of center back to the right. Ann looks to the east in this view from the high point above park headquarters looking south. Note the 'knob' landmark on the rim at the left side. A childhood dream comes true as I view the Meteor Crater. 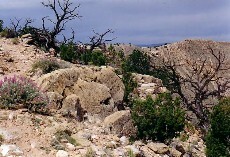 Landmarks are the red streaks down the opposite side, the rock layers protruding below the rim to the left, and the four cedars at lower left. 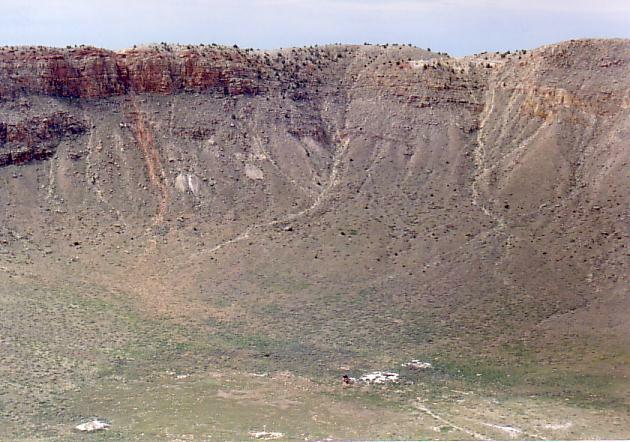 A view of the south rim and bottom of the crater. The red streaks and rock protrusion are visible on the left. It shows the site of old drilling operations on the floor. This telephoto view of the bottom of the crater, as viewed from the north rim. In the center of the photo is a life-size cutout figure of a spacesuited astronaut beside a USA flag. Check the large image to see it. This is a view of the south rim from the east. The top of the red streak and top of the west end of the protrusion are visible. Note the distant mountains. Vegation along the top of the rim on the east side. The trail is visible curving from lower left to upper left. The outside of the east rim looking south. Walking the trail after having made the previous shot. 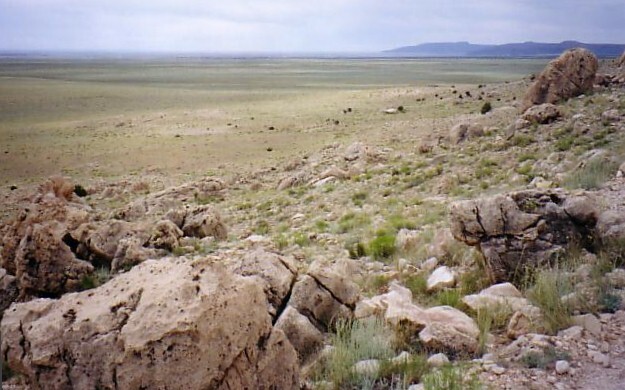 View east from the east rim. The land seemed to be more sandy along the southeast and south sides. 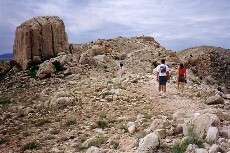 Other hikers on the trail near the 'knob' landmark on the south east rim. 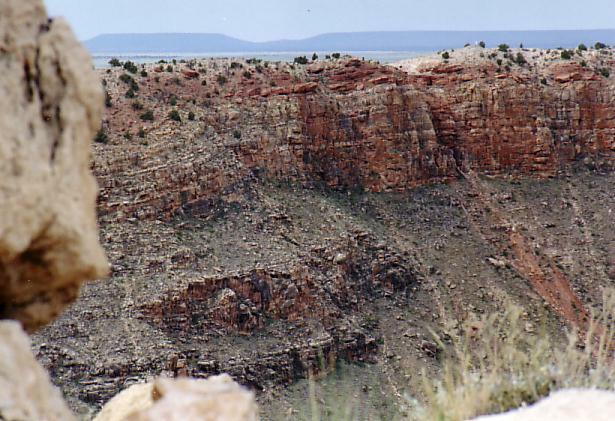 This view along the south rim looking west was taken from a point above the rock protrusions and the red streak. Photos from the Crater Floor - This site has several excellent views of the crater rim taken from the crater floor. There is a telephoto view of the equipment near the center of the floor that is better than the view I have. The astronaut cut-out is there, but there seem to be some differences. 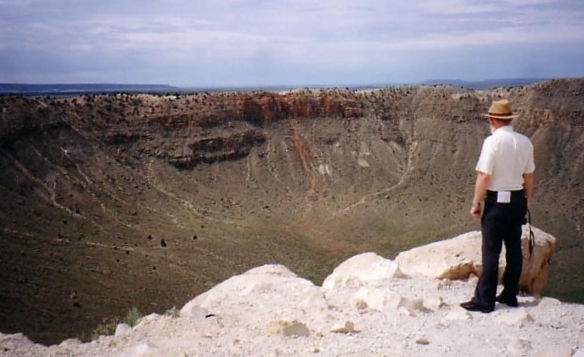 The Barringer Meteorite Crater - "Of course I had not been at the crater one day before I knew that the crater was an impact crater..." - Letter of D.M. Barringer to Elihu Thomson, 4/25/1911. Page titles: Crater News, The History (diagrams of geologic strata and steps in creation of the crater), Environmental Effects of the Impact, and The Adventure (D.M. Barrigner's story). 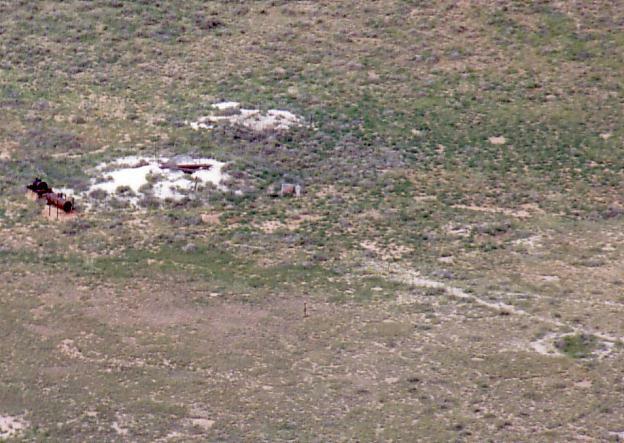 There is an ariel photo view from the east southeast. OUTDOOR PLACES.COM - "Your hiking, camping, paddling, travel place." This site has a good written description of the crater's creation and history and its current situation. There is a nice photo of the south rim. JPL Meteor Crater Site - Several ariel photos - some in the public domain. A couple of photos taken in the winter of 1978. Meteor Crater Rim Tour - This is a journal of a group that made the hike around the rim. Little icons in the text link to photographs - scenes of the crater and meteorite fragments, old structures, and other items of interest. The Great Road Trip - Freda, Joe, Ernest, Elsie, 1936 - The New York to California Road Trip was a little different in 1936.. Photos of this group of young people, their car, and the things they saw during their travel west. The photos are well worth the slow loading time. 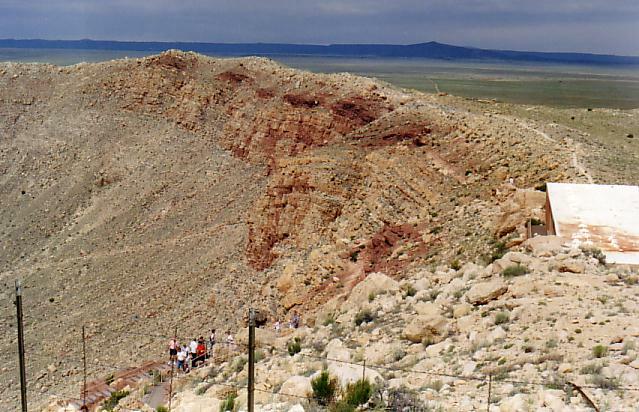 The meteor crater is just a small part of what they saw. Photos are all B&W of course. There are only a couple from the meteor crater, but you're ready for something else now, aren't you?